Welcome back to our 72 hour emergency kit series! This week we’re covering fire and heat. Hypothermia, (not keeping your core body temperature high enough) is the most common outdoor killer. You can die from hypothermia even when it’s not winter. If you are planning to use your emergency kit to evacuate to the woods, the ability to stay warm and light a fire are way up the important scale for your kit. The importance of fire is not just limited to keeping yourself warm. For more benefits of fire plus the basics on starting a fire, click here. 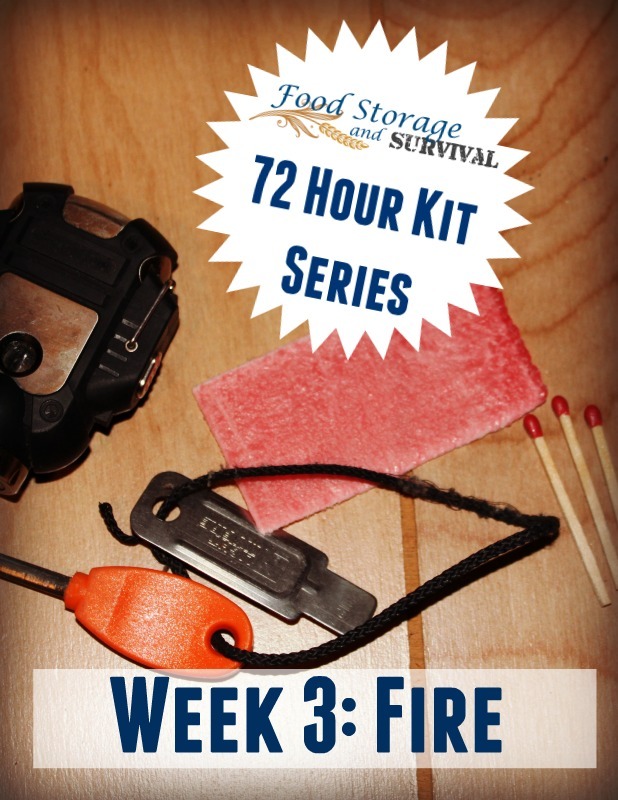 In this post, we’ll discuss fire starting options to carry in your kit. Whatever fire starting methods you choose to pack in your kit, make sure you know how to use them to get a fire started, even under adverse conditions. This might take some practicing! Try to keep your fire starting methods compact and light weight, especially if you are planning on carrying your kit for any distance. It never hurts to carry more than one method of starting a fire–just in case. 1. Lighter. Lighters range from the super inexpensive disposable lighters to high end storm proof lighters. The disposable style are easy to find, cheap, and work well to get a fire going. When the fuel is exhausted, throw them away and get another. 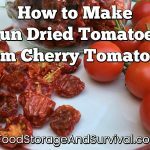 The drawback to them is they can occasionally crack and leak, meaning that not only do you not have a way to get your fire going, you also have a mess in your pack. In the kits I have disposable lighters in, I put them by themselves in a zip seal bag so if they do leak, the bag catches the mess. Reusable lighters are much sturdier, and can be refilled with fuel if you use it all. Find one that is “storm proof” for the extra flame strength less likely to be knocked out by wind or rain (I show the difference in flame between a standard and storm proof lighter in the video below). 2. Matches. You want your matches to work when you need them, so either get waterproof matches, make them yourself, or seal your matches in a waterproof container in your kit. A step up from waterproof matches are what are called storm proof matches. These are thicker than standard matches, and burn hotter and faster. I haven’t tried them in an actual storm, but I’ll do a video to show you how they burn. You really have to be ready with your fire tinder! 3. Striker. The striker group of fire starters has almost as many variations as the lighter group, but they all work on a similar principle–rubbing or striking two things together that make sparks and using those sparks to ignite your fire. If you are planning on using a striker, some type of fire starting help that will light with a spark like cotton balls saturated with petroleum jelly or char cloth will make getting your fire started so much easier! We’ll cover some other fire starting helps at the end of this list. If you’re feeling crafty, you can get a ferrocerium rod blank here and make your own handle for it. Now let’s talk about a few more ways to get a fire started that you could include in your kit that aren’t quite as common, but also aren’t quite as easy to use. You’ll want to practice double with these to be comfortable getting a fire going. 4. Flint and steel. I don’t show this one in the video, but it’s one you could theoretically make work if you only had your knife and could find a piece of flint. Lighting a fire with a flint and steel is helped tremendously by char cloth and lots of practice. 5. Magnifying glass. Click the link for a video I did of how to light a fire with a magnifying glass. It’s not too hard, but you do need to have good sun to get it going, so it won’t work in a storm or after dark! 6. Parabolic lens. 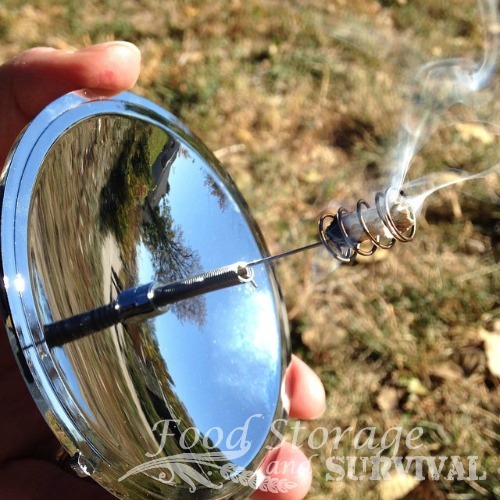 Another solar based fire starting method using a parabolic reflector lens. You’ll need sun for this one. It’s not quite as easy as a magnifying glass, just because it’s harder to tell where you have the sun focused, but overall, not too difficult. 7. Bow drill. This method takes practice! However, if you get good at it, you can make a fire with a knife and a boot lace, letting nature provide the other parts of the bow drill. I absolutely believe in getting help starting a fire, especially if it is something you struggle with under non-stressful circumstances! Here are some of my favorite helps to get your fire going strong that are easy to carry in your kit as well. Fatwood–Nature’s perfect fire starter, this wood is saturated with dried sap, catches fire easily, and burns long and bright. You may be able to find it yourself in the woods or purchase it shredded here. The shredded stuff can catch fire with a spark, larger pieces need a little more flame time to start burning. Dryer lint/wax fire starters. Love these, and we can make them by the hundreds with the amount of laundry we do in this house! Need a flame to get lit, but they’ll burn for 15+ minutes each! Wallet sized fabric and wax fire starters. Small, light weight, cheap to make, and perfect for carrying in your wallet or emergency kit. Light with a flame. Char cloth. Carbonized cloth that catches a spark and holds that ember long enough for you to get your tinder lit. Lights easily with flame, spark, or concentrated sun rays. Burn snack chips. Got Cheetos? They’re good for more than just eating! You’ll need a flame to get these lit, but they burn longer than you might think. Dryer lint and petroleum jelly fire starter (also works with cotton balls). Super cheap and will light with a spark from a striker or a flame. Burns about 3-5 minutes each. Stay warm without a fire! Hand warmers. I love these things and use them regularly when we’re doing outdoors in the winter. They are also great for tucking in a sleeping bag with you to raise the temperature. Catch them on end-of-winter sales and stock up! Warm clothing in layers. We’ll discuss clothing another week, but having warm clothing and clothes that you can layer goes a long way toward keeping your core body temperature up. Extra blankets or emergency blankets. We’ll also cover these another week. Want the visuals for this post? I split this week’s video into two parts to keep it from getting too long. In the first half I show you some of the fire starting options we discussed above, and in the second half I show some of the fire starting helps. What do you carry in your kit to get a fire going?